Two years ago, my calendar was a barren wasteland with the occasional stray task or meeting. 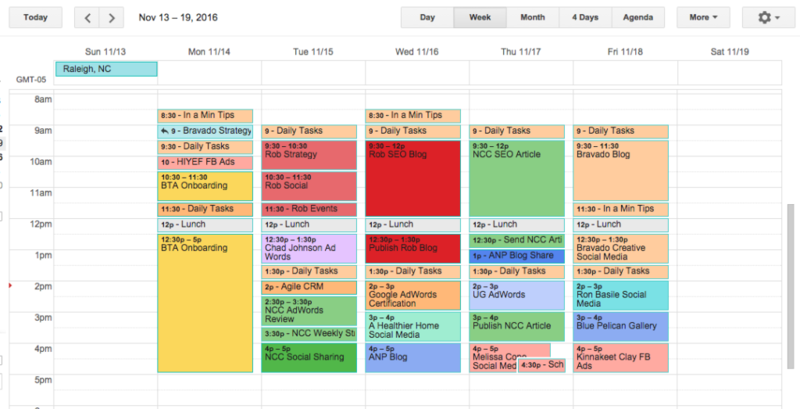 Today, my calendar is a color-coded puzzle of productivity. What changed? I ruthlessly committed myself to using time blocks for managing my work week. As a digital content strategist, my days are filled with a wide range of tasks. From research and strategy creation to PPC management and content writing, every day requires both sides of my brain. Switching between left and right, high level strategy and detailed creative execution, can be mentally exhausting. Often, I arrive home after work and my ability to form sentences disappears. After writing thousands of words of targeted content for clients, my brain feels empty. Todd Henry, fervent proponent of “dying empty,” would be proud. For me, the hardest thing about productivity is translating the endless stream of Entrepreneur articles into reality. How can I actually implement the 5 Ways to Boost Your Productivity slideshow I saw on Forbes? How can I segment my time when there is just so much to do. This is the conundrum of small business operations. We know that we need to implement productive habits, but we are focused on growing, juggling, and checking off our to-do list. My boss and I often discuss how awesome we feel when we honor our time blocks and take time to move during the day. Divide and conquer, then take a leisurely stroll around downtown Asheville. It’s a wonderful balance and we always return to our desks refreshed, ready to tackle the next project. So, in an effort to combat burn-out, boost my productivity, and honor my time, I decided to give time blocking a try. Now, nearly 2 years later, I am proud of my meticulously planned out work week and the resulting boost in productivity. My well-maintained calendar is the hallmark of my work ethic. My clients and my colleagues have grown to know and respect my method. I am emptying my creative reserves each day, pouring energy into every task. And, I must admit, I am addicted to my pretty color-coded calendar (but more on that below!). My zest for time blocks was partially ignited by a little orange book I purchased on a whim from Malaprops in downtown Asheville. I was feeling overwhelmed by the online articles touting their productivity secrets. So, one day I popped into the bookstore to see if they had any professional development books. I found The Accidental Creative: How to Be Brilliant at a Moment’s Notice by Todd Henry and gave myself 2 weeks to read it. What I didn’t know when I first picked up The Accidental Creative, is that Todd Henry is the tour de force behind an entire movement that seeks to help creatives and professionals utilize their talents and fulfill their potential. 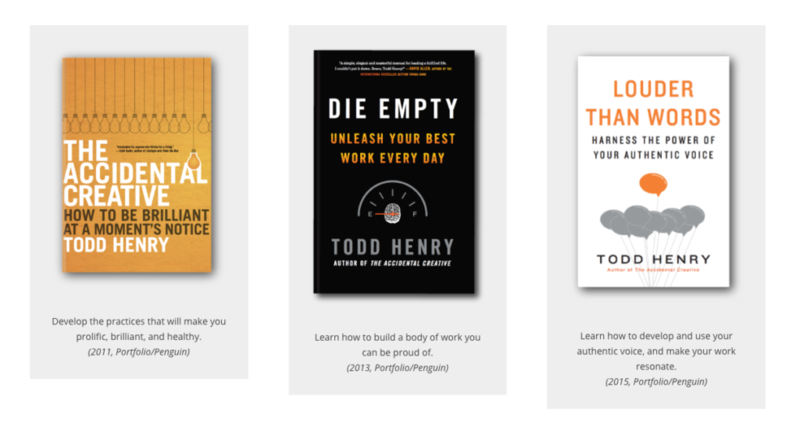 I highly recommend all three of his books, especially for those who think creatively for a living. After reading Henry’s wise words about creating systems, rituals, and priorities, I dove head first into time blocking. When I say time blocking, I mean that every client project, internal task, and to-do lives on my calendar in the form of a time block. Since I am a tad obsessed with organization, my time blocks are also color-coded by client and they fit together like a game of adult Tetris. All of my recurring tasks occur at roughly the same time every week, which I have fine-tuned based on my own personal creative rhythm. It didn’t take me long to learn that after writing a 1,500 word SEO-optimized article on a Tuesday morning, I then needed an afternoon filled with shorter time blocks like social media post creation or PCC campaign reporting. I balance my days between the tasks that require a 3 hour time block and those that only need 30 or 60 minutes. Your rhythm is probably different than mine- and that’s the beauty of time blocks: you get to make them your own. My time blocks are also flexible, because they have to be. When we are onboarding a new client, hours of set-up and strategy are required. Once I receive my responsibilities and deadline for the client, I spend time rearranging time blocks to make space for the new client on boarding. By staying flexible and spending time to analyze upcoming projects and deadlines, my time blocks can absorb extra work when needed. Time blocking has also transformed my client relationships, from onboarding through to monthly management. When we sign a new client, I spend time scheduling out their set-up tasks. Then, I create recurring weekly tasks and time blocks for their monthly management. The relief of saying “no” to things that are not in line with your priorities or your schedule is amazing. This is not to say that I refuse to do work… I don’t. I am just much smarter about taking on superfluous to-dos that don’t help my company or my clients. I honor my time blocks, which in turn honors my colleagues and my clients. My mental sanity and productivity boost are the cherries on top. OK, so the dirty truth about time blocks is that they keep you on track. Or else. When I arrive to work in the morning and see 7 time blocks stretching out in front of me, it motivates the heck out of me. I work diligently through each block, zeroing in on successfully completing the time block in the allotted window. After a full day of strategic mono-tasking,I leave my desk at 5pm with a huge sense of accomplishment. Time blocks also free up your mind to focus. Instead of tracking a mental checklist, your mind can really be present in the moment. I am a huge proponent of using your mind to think, rather than to store information. Time blocks allow me to “dump” my tasks onto my calendar and then forget about them until my calendar pings me, “Call with Rob in 5 minutes.” And, since the call prep was also scheduled into my work week, I simple open the corresponding document and dial. No scrambling, no forgetting. There is one drawback to using time blocks: if a task takes longer than expected, your calendar is busted. When your week is scheduled out perfectly, down to the minute, there is zero room for error. Since I am human, some tasks do take longer than I anticipate. If it is a recurring task, I immediately edit all recurring events in the series to reflect the true time it takes. This often happens at the beginning of a monthly client relationship. It usually balances out, with some tasks taking less than their allotted blocks. To help protect my calendar against these time busters, I schedule two thirty minute time blocks per day called “daily tasks.” I use this time to answer email and to group together all of those other tasks that sneak up throughout the day. Normally, this hour per day is sufficient and helps keep my time blocks on track. Are you ready to transform your productivity with time blocks? If you are a proud multitasker, like I once was, the idea of time blocking is pretty terrifying. Start small by scheduling blocks for answering emails, eating lunch, or reviewing your daily agenda. Then, slowly add in time blocks for your recurring tasks. The best place to start for many entrepreneurs and small business owners is scheduling time blocks for social media. Even though you know it’s vital, it is one of the first things to go out the window during a busy week. Schedule one hour on the same day, at the same time, every week. Use this hour to collate content, create original content, and schedule out posts on one or two platforms. Start small, then scale to other high priority tasks like payroll, reconciliation, and client communication. Happy time blocking! If you want to nerd out over my calendar or pick my brain about productivity hacks or digital marketing, email me: katherine@bravadocreative.com!